US reusable water bottle maker Vapur launches a new product, the Vapur Element Anti-Bottle, tailor-made for a life on the go. 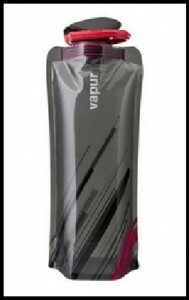 According to Vapur, the reusable water bottle is cool, clean and collapsible, offering portable, performance hydration with a new silhouette and innovative new lid design. It features a brand new, proprietary and patented wide-mouth Supercap, which offers ease of use and quicker drinkability. It can be clipped on for any urban, sport or outdoor active pursuits. When it is empty, the user can fold and stow it so that it takes up only minimal space. Vapur adds the Element is unique not only in function, but also in its composition. It embodies the original sustainable and leading designs of Vapur’s founding “Anti-Bottle” products, including the 3-ply combination of BPA-free nylon and antimicrobial polyethylene. This construction makes the Element foldable, freezable, and dishwasher safe. In addition, Vapur’s patented, flexible design is lighter and easier to grip than rigid bottles, and it rolls up, collapses or folds flat when empty. Vapur stresses that the new Element, as the first Vapur Anti-Bottle designed to meet the greater hydration demands of athletes and those living an active lifestyle, is available in larger sizes (0.7L and 1L) and three unique, identifiable designs: Water, Fire, and Wind.